Cyclesnack: A Penny for your thoughts? Paid a visit to the Bicycle Goodie Shop in Bethel Friday night to see what they have for cables because over Christmas I am going to change the bars on the Qball, I think Santa will be making a stop in Markham, ON and putting some Fme bars under the tree this year. Upon entering the store they had a modern day Penny Farthing, sort of. Turns out it is a Corker Wheelman, which is basically free wheeled uni with a training wheel. It has 36 inch wheel, that according to the owner runs around $70 for the tire and $30 for tube! 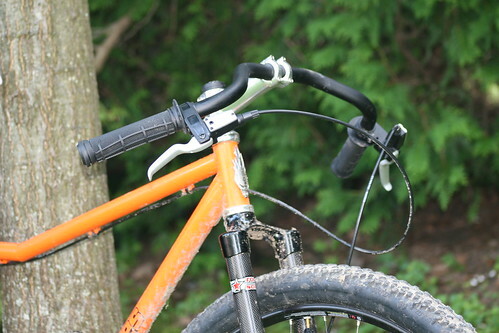 It has both a front and rear brake and a freewheeled hub up front. I test rode it around the parking lot and found that the stem was too small for me. The tops of my legs kept hitting the underside of the bars and forget toe overlap, try the legs! Turning the wheel too much to other side resulted in considerable leg rub.